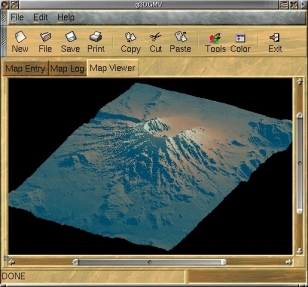 The g3DGMV program was designed as a free viewer for Digital Elevation Model (DEM ) and Digital Line Graphs (DLG ) maps. Both of these formats are available from various locations on the web. These maps are rendered by g3DGMV as 3D images that can be manipulated by the user and view from different angles. In addition g3DGMV can read maps that have been saved as bitmaps (gif ,png, jpeg ,xpm). Because these formats do not contain elevation information they are viewable only in 2D mode. The program contains many utilitys that enable the user to add his/her own location information to these maps. These tools can be used to mark a favorite camp site or highlight the best route to some location. g3DGMV is an Open Source Free Software program, primarily designed for use with X Window System. It is being developed using the GTK+ and Gnome tools . Diese Seite wurde zuletzt am 26. Oktober 2006 um 08:16 Uhr geändert.